The Corpus Christi regional water system is proving again the value of long-range water supply planning and taking action to assure that water is available when it is needed decades in the future. It has been more than 20 years since an agreement was reached to purchase 35,000 acre-feet of senior water rights in the Colorado River. That water is now needed and work is underway to deliver it to Coastal Bend households and industrial customers in the second half of 2015. When water begins flowing from a new pump station near Bay City it will mean that the Corpus Christi regional system has taken another big step toward water supply diversification and improved reliability in times of drought. Water supplies will be coming from three river basins – the Colorado River, Lake Texana on the Navidad River, Lake Corpus Christi on the Nueces River and Choke Canyon Reservoir upstream on the Frio River which is part of the Nueces Basin. Engineering has been completed on the $160 million project and virtually all of the easements for the 54-inch diameter pipeline have been acquired. The 100-mile-long Mary Rhodes Pipeline, completed in 1998, was built with extra capacity to allow it to transport the Colorado River water and potentially water from other sources. 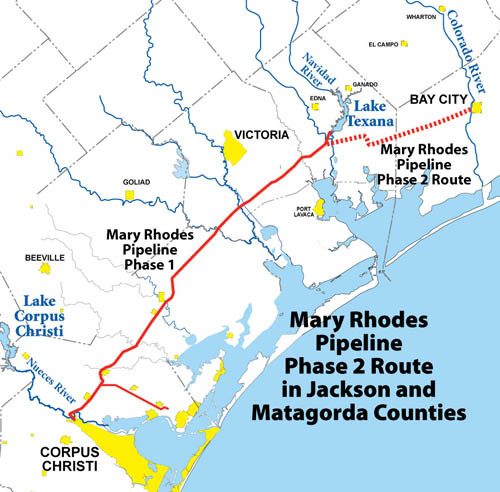 The 41-mile route of the Phase 2 pipeline starts just west of Bay City in Matagorda County and follows the path of State Highway 35 to Blessing where it then follows the Union Pacific Railroad to La Ward in Jackson County. From there it turns north and west to link up with Mary Rhodes Pipeline Phase 1 at the Lake Texana pump station [SEE MAP BELOW]. The City of Corpus Christi, acting as manager of the regional system, approved a $4.5 million contract in December to pre-purchase long delivery time pumps and motors for the project. Construction of a sedimentation basin next to the Colorado River will begin in March. A pipeline construction contract will be awarded soon. Planning and design for the pipeline project has been moving forward since the first engineering contract was awarded to Freese and Nichols in 2003. In the early 1990s Bernard Paulson was chairman of Mayor Mary Rhode’s long range water task force. He was also a former Koch Refining president and president of the group now know as the Port Industries of Corpus Christi. He would later serve as a member of the Port Commission. Gary Bushell was then president of the Corpus Christi Bay Area Economic Development Corp. In 1992 Paulson and Bushell began meeting with the late Bill Lehrer of Garwood who controlled the Garwood Irrigation Company which owned 168,000 acre-feet of the most senior water rights in the Colorado River, water which the company provided to coastal rice farmers. They negotiated an option agreement to purchase rights to the 35,000 acre-feet a year from the Colorado River which flows from the Texas Hill Country through Austin and on to the Gulf of Mexico near Bay City. In 1993 the state agency now known as the Texas Commission on Environmental Quality (TCEQ) authorized an amendment to Garwood’s water right which allowed the use of 35,000 acre-feet of its rights for municipal and industrial purposes. In 1998 the TCEQ approved Corpus Christi’s purchase of the water and three months later the transaction was completed with the city paying $15 million for the new water supply. The purchase was approved by a City Council led by former Mayor Loyd Neal. City of Austin officials had challenged Corpus Christi’s application to make the purchase. 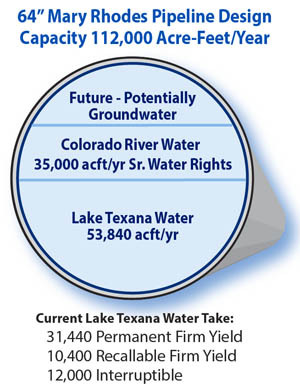 Austin dropped that opposition after the Lower Colorado River Authority bought the remaining 133,000 acre-feet of water rights held by Lehrer’s Garwood Irrigation Company. As part of the TCEQ order allowing the sales, the rights purchased by LCRA were made senior to the rights purchased by Corpus Christi. That means the Corpus Christi rights, priority dated Nov. 2, 1900, are one day behind LCRA's 133,000 acre-feet but ahead of all other large rights holders on the Colorado. In the event of a shortage of water, priority dates determine which rights holders will receive their allocated share of the water that is available. This is a "run of the river" water right which means that if there is no flow in the river at Bay City then no water can be diverted. It is likely that Corpus Christi will not be diverting during some dry months but will be able to take its full 35,000 acre-feet during the rest of the year. Corpus Christi is authorized to pump water from the Colorado at a maximum diversion rate of 298 acre-feet per day. The water will be pumped directly from the river into a sedimentation basin located just north of the SH 35 bridge. A booster pump station at the site will send water down the pipeline to be blended with water from Lake Texana and later with water from the Nueces River. Delivery of the Garwood water has been identified as a key water supply strategy for the Coastal Bend since the deal was struck with Lehrer in 1992.. It has been part of the State Water Plan for more than a decade. Current Corpus Christi Mayor Nelda Martinez and the mayor’s Blue Ribbon Task Force have voiced strong support for moving forward with the project as soon as practical in light of growing residential and industrial water demand in Coastal Bend communities that rely on the regional supply system. Pipeline construction and operating costs will become part of the region’s shared base raw water cost and will require a future incremental increase in water rates.